Theresa May's Snap Election: Is It Really About Brexit? Speaking outside Downing St. on April 18, Prime Minister Theresa May said that it was parliamentary opposition to Brexit which lay behind her surprise decision to seek a snap UK general election for Thursday, June 8. "If we do not hold a general election now their (the opposition's) political game-playing will continue, and the negotiations with the European Union will reach their most difficult stage in the run-up to the next scheduled election," Mrs. May declared. But is Brexit the real reason why a second general election in just three years has been called? The government's Article 50 Bill, has after all, cleared Parliament safely. 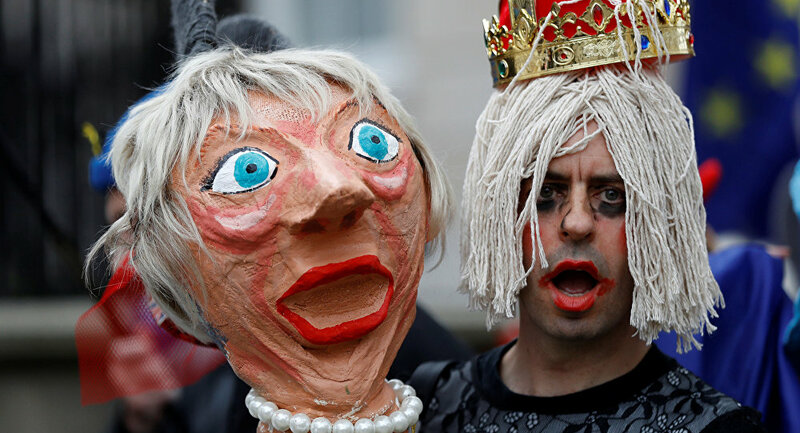 And if the opposition did try to block or significantly water-down any deals she reaches with Brussels — why not go to the country dressed as Boadicea there and then? May's move doesn't make much sense — until you look at the bigger political picture. The call for an early election move is less about the Prime Minister trying to get Brexit deals through Parliament than it is about her attempting to exploit the extraordinary lead her party has in the opinion polls. Two recent polls put the Tories 21 points ahead of Labour. It's not as if they were freak findings. The Tories have been between 14 and 21 points clear of Labour since late July 2016. Any Prime Minister who has had such a commanding lead for several months would be severely tempted to go to the country — and vicar's daughter Theresa May is no exception. It's not as if people are in love with the Tories and that their policies of cuts in public services and privatization are popular. On the contrary, the polls show stronger approval for Labour policies — such as a £10/hr (US$12/hr) minimum wage, which around 70% of voters support. The trouble is that the Labour Party has been in a state of civil war for most of the past year, caused by the failure of Blairites and Brownites to accept leader Jeremy Corbyn's democratic mandate. "Corbyn's a disaster who could never win an election" is "The Bitterites" refrain. But in March 2016, polls showed Labour neck-and neck with the Tories, or even edging slightly ahead. However, at around the same time a row over alleged anti-Semitism in the party flared up and later, a new "coup attempt" against Corbyn began. Instead of being free to take on the Tories last summer, Corbyn had to face a fresh challenge to his leadership from Owen Smith. The party's popularity has been in freefall ever since, with the public deciding, not unreasonably, that they can't support a party that appears so divided. The Bitterites anti-Corbyn refrain has become a self-fulfilling prophecy. It's not just Labour's internal divisions which have benefited Mrs. May. UKIP, who posed such an electoral threat to the Tories — and Labour — not so long ago, have imploded since last June's EU Referendum. Their only MP, ex-Tory Douglas Carswell, has resigned from the party, with UKIP donor Arron Banks pledging to stand against him in Clacton-On-Sea. Diane James, who replaced Nigel Farage as party leader, lasted just three weeks in the post. New leader Paul Nuttall, who, for some reason decided to dress like a character from The Wind in the Willows, stood in Stoke Central, the so-called Brexit capital of Britain in Feburary and failed to win. United Kingdom Independence Party (UKIP) leadership candidate Paul Nuttall arrives to hear the result of the UKIP leadership election, in London, Britain November 28, 2016. In the circumstances, Theresa May would be stark raving bonkers not to call an election with her opponents in such disarray. But having pledged — as recently as March — that she would not be calling an early election, she can't come out openly and say she now wants to exploit her poll ratings — so instead gives us the blather about "strong government" and the need for "unity" at Westminster. If she does get the two-thirds parliamentary approval required for her election, then it's clear that the Prime Minister will be fighting the June 8 poll as a referendum on her government's Brexit plans. Labour — if it is to have any chance of winning, or even preventing a Tory landslide — desperately needs to steer the debate away from Brexit (on the grounds that it's happening anyway), and on to other issues. In addition to campaigning on the NHS, pensions, and the cost of living crisis, the party — or at least the part of the party that supports Corbyn — needs to warn that a large Tory majority would make it much more likely that the UK would join in with future US wars — against Syria — or other countries. In its present composition it would be difficult for May to get parliamentary approval for, say, British involvement in all-out assault on the Syrian government. But that could all change spectacularly after June 8. Ironically, an election fought on the pretext of guaranteeing UK's independence from Brussels could end up further cementing Britain's subservience to the US. Hawks in Washington, mindful of how the House of Commons helped block airstrikes on the Syrian government in 2013 will certainly be hoping for Brits to return a War Parliament. Pro-war Blairites in Labour will be hoping too that a crushing defeat for Jeremy Corbyn would mean they'd be able to push through changes to the party's leadership election rules to ensure that an anti-war left-winger never becomes leader again. After June 8, we could well have a Parliament less in tune with public opinion on a number of important issues than now. To avoid that, we need to reject Theresa May's stated reason for calling the election — and remember that we already had a vote on Brexit last June. After all, voters don't have to accept what a Tory Prime Minister says a general election is about. In February 1974, Ted Heath went to the country over a year early saying that the poll was about "Who governs Britain?" — the government or the unions? He thought that would seal the deal. But Labour leader Harold Wilson successfully made the election about much more. Corbyn must do the same now, or else face a heavy defeat.